I was delighted when the Irish Family History Foundation announced that it had revamped its Roots Ireland website (www.rootsireland.ie) recently, not only to provide better search terms but also to provide a discount for the records of multiple vital events in a family group. Tonight I decided to do a search for children to my great great grandparents Edwin Graham and Florence Halliday of Belfast, who had previously married in 1881 in England. I already knew of most of the names of the children that they had, and the rough year of birth, identified either from census records or from the old index to the IFHF site. The records on the IFHF site for Antrim have been provided by the Ulster Historical Foundation, and many of them have previously been made available also on the UHF's own site at www.ancestryireland.com. From the UHF site I had already obtained the dates of birth of two of the children - Alexander William Graham born 7 SEP 1889 and baptised two weeks later on the 19th; and Frederick Graham, born July 6th 1901 and baptised July 29th. In addition, from military records, I had the birth date of another brother, Gerald Graham on March 11th 1895. A parent search on the IFHF's Roots Ireland site tonight returned ten children to the couple, including the three noted. I paid 20 Euros - what a bargain! - only to then discover with horror that the UHF supplied records on the site do not contain the same information that I had previously discovered on the UHF's own site. So what is missing? Fairly fundamentally, would you believe that the date of birth is missing from these civil birth records from Belfast? The info on the Roots Ireland site is labelled "Date of baptism/Birth", but the date given in the three examples that I do already have dates for are not birth dates, but baptism dates. The real irritation is that the records are clearly labelled "Civil Birth Record" at the top. Does this just apply to the IFHF records for Antrim - or is it more widespread for other counties? I would strongly urge everyone using the site to check what you are finding. You may not be getting all the information that you think you are. I have emailed the IFHF and asked them to explain the discrepancy. FindmyPast TV adverts - behind the scenes! I recently blogged that FindmyPast.co.uk had created a new television advertising campaign for broadcast on Watch, Yesterday and Blighty. Today, Debra Chatfield the company's marketing manager, has blogged about how the adverts were produced - a beautiful historic mansion, a talented camera crew, a production on time and on schedule, and a killer on the loose outside in the nearby village... not your typical shoot really! Fraser Simon born about 1787 Edderton Rosshire enlisted 25th March 1804 served wiith 78th Foot 24th June 1817. Joined 59th Foot at Fort William Bengal 25th June 1817 served in India till 27th April 1816 discharged to pension 11th May 1826, he was described as being 5ft 6” in height with black hair, hazel eyes and of a fair complexion, although he was a drunkard he was otherwise a good soldier. In this example the soldier's WO121 record does not mention that he served with both the 1st and 2nd Battalions of the regiment, the actions in which he served, or any details of next of kin, but certainly does provide a great deal of useful infromation which can be further acted upon. The bottom line is if you can't find them in WO97, try WO121 - some of the missing info may be further reconstructed from muster rolls, attestation papers and other records if they have survived. Discover my Past Scotland issue 22 (August 2010) is now on sale at www.discovermypast.co.uk. This month John Hannavy examines Edwardian seaside attractions, Frank Bruce looks at Scotland's musical heritage, Sue Wilkes researches Mary Queen of Scots, Caroline Makein investigates the history of Scottish pubs and publicans, and Katie Howard investigates Dumfries sources. Yours truly looks at nonconformist Scottish Churches and their records, as well as the latest news and reviews, and there are all the usual regular columns - and all this for just £2.50! Don't forget that Discover my Past now has a new Facebook page at www.facebook.com/pages/Discover-my-Past/141819532496781! Time to shamefully abuse my own blog for personal ends yet again! "The crossing itself is 140 ft in the air and 700 ft across which is scary enough but add to that the fact that I'm a complete coward and you can see what a challenge this will be. Chances are you'll hear my screams no matter what part of the country you're in so to capitalise on this - whoever sponsors me the most I'll scream whatever hilarious and self-depricating phrase they nominate." For more on the Scottish releases, see my guest post on the Ancestry blog. FindmyPast.co.uk has updated its Chelsea Pension records to include the period we've all been waiting for - 1760-1854! For more on the release see http://blog.findmypast.co.uk/2010/07/chelsea-pensioners-1760-1854-just-launched/. This joins the recently launched facility for Cavan, Derry, Fermanagh, Galway West, Kildare, Kilkenny, Tipperary North, Tyrone, and Westmeath. For more on the new advanced site, see http://scottishancestry.blogspot.com/2010/07/rootsireland-welcome-online.html and http://scottishancestry.blogspot.com/2010/07/more-on-ifhf-site-redesign.html. Business Archives Scotland has blogged that Pringle of Scotland is looking to create an archive, and as such is appealing to the public for help with possible contributions. To tie in with the new release of Perthshire and Scottish records on Ancestry.co.uk, those loveable loves from loveville, I mean Ancestry, recently asked me to write the first ever guest post on their new blog. And a quick word about library access - you can gain free access to the records at the collections at any library that has Ancestry's library edition, including all those in Perth and Kinross! The Perth and Kinross Archive also has many databases online which complement the release, including several militia databases which go hand in hand with Ancestry's 1802 Militia Act survey returns collection - to see P&K's collections, visit their online site. The latest online issue of the National Archive's Archive Sector Update is available at www.nationalarchives.gov.uk/documents/archive-sector-update-summer-10.pdf - including the latest details on the national Religious Archives Survey. Here's some good news I've been wanting to share for a very long while - at last, here goes...! Ancestry (www.ancestry.co.uk) has now released several major Scottish records collections on its site, in the most significant specifically Scottish release since it uploaded the census transcripts a couple of years back. 1) The 1766 and 1773 Surveys of Inhabitants of Perth (the burgh, not the county) - a census essentially from the two years in question - there's a free index for non-subscribers, and digitised images of the original handwritten entries for those with subscriptions can be viewed. 2) The Register of Deeds for Perth 1566-1811 (The first major digitised set of such registers from Scotland to go online). These are name and year searchable, but can also be browsed by volume. They are some of the most useful documents for the burgh of Perth, but bear in mind that the records in the earlier registers are written in the old form of Secretary's Hand. If you do not understand this style - it is very different to modern handwriting - visit the Scottish Handwriting website at www.scottishhandwriting.com for useful tutorials. Deeds were agreements between two individuals voluntarily registered in a court to prevent against fraudulent claims. The registers contain records of bonds (IOUs), sales contracts, receipts, charters, protests (a demand for a monetary payment with penalties for non payment outlined), dispositions, and other documents. 3) Fasti Ecclesiae Scoticanae - biographies on every Church of Scotland minister from 1560-1866 for the synods of Glasgow, Ayr, Lothian and Tweedale, Aberdeen, Angus and Mearns, Argyll, Glenalg, Moray, Ross, Sutherland and Caithness, Orkney, Zetland (Shetland), Fife, Perth, Stirling, Merse and Teviotdale, Dumfries and Galloway. 4) The Register of the Great Seal of Scotland 1306-1651 - in Latin, but usually quite easy to work through, and from the printed volumes created from 1882-1914. The register records charters granted under the Great Seal. 5) The Register of the Privy Council of Scotland 1545-1632 - again, in Latin, and from the printed volumes created from 1882-1914. From Wikipedia - The council's "registers include a wide range of material on the political, administrative, economic and social affairs of Scotland. The council supervised the administration of the law, regulated trade and shipping, took emergency measures against the plague, granted licences to travel, administered oaths of allegiance, banished beggars and Gypsies, dealt with witches, recusants, Covenanters and Jacobites and tackled the problem of lawlessness in the Highlands and the Borders." There is also more to come, and don't forget that Ancestry recently released the 1802 Militia Act Survey results from Perth and the Perthshire school registers collections. Bottom line, if you haven't yet got an Ancestry subscription, now may very well be the time to sign up! Ancestry has also very kindly invited me to write a guest blog post on the release, which I believe will be going online imminently at http://blogs.ancestry.com/uk. I actually witnessed these records being digitised, and I hope you'll read the piece to hear about a man who was instrumental in their production - a man called Ken! I've dithered for a long time about whether to join a professional genealogy organisation, but have finally signed up to the internationally recognised Association of Professional Genealogists (APG), which is based in the United States. My APG profile is now online at www.apgen.org/directory/search_detail.html?mbr_id=4730. In the interests of fair competition, I should add that there are six other genealogists currently registered with the APG in Scotland, and many more across the British Isles. The PRONI self-service microfilm facility will open at Cregagh Library, Belfast on Wednesday 8 September 2010 and continue until PRONI re-opens at its new premises in Titanic Quarter in April 2011. 10 Microfilm readers, a microfiche and a reader printer will be available. A booking system will be in place for 5 of the microfilm readers with the remainder available on a ‘first come, first served’ basis. Users can reserve slots for 1 or 2 hours, up to a maximum of 2 hours per day. Advance bookings for microfilm readers may be made after 6 September by telephone (02890 255900) or from 8 September in person at the PRONI Cregagh Library facility. The booking system will be reviewed subject to demand. All PRONI self-service microfilms, including church registers, will be available at Cregagh. A full list of these can be seen at self-service collections. As the 1901 Census is now freely accessible online, it will not be available on microfilm at Cregagh. A Microfilm Request facility is now in place for PRONI@Cregagh. Requests may be made until 21 August 2010. Only microfilms requested in advance will be available due to PRONI’s extended closure for relocation. Requests for up to 20 reels of microfilms not usually available via the self-service system may be made. Viewing arrangements at PRONI@Cregagh must be confirmed in advance as the records will not be stored at Cregagh. Ordnance Survey Ireland has updated and expanded their online map collection. The maps range from 1830 to the present and the new site is designed to assist people in finding their Irish ancestor. The website was rebuilt following the recent online launch of the 1901 Irish census. The interactive maps on this website help genealogists focus on specific regions of the country. There is a cost to purchase maps of local areas. This site, however, has the most extensive collection of online Irish maps. "We'd love to hear funny, unusual or moving tales from your family history. If you have something you'd like us to publish, simply email us. We'll select our favourite story each month, and the writer will win two day-passes to a National Trust property, plus a cream tea voucher. Please use no more than 300 words, and include your name, address and phone number so we can contact you if you win." This has been on the FindmyPast.co.uk site for a couple of months, but if you have not seen it, the following short feature explains the Cheslea Pensioner military service records collection currently being released by the company. More records should be available in the next week or so covering the period from 1760-1854. Chelsea Pensioners Army Service Records - mini feature from findmypast.co.uk on Vimeo. This year’s Angus and Dundee Roots Festival will run from Thursday, September 23 until Monday, September 27 and will consist of a long weekend packed full of events devoted to assisting family historians with ancestral links to the east coast of Scotland. During this year’s Festival, the inaugural Tayroots McManus Lecture will be held at the McManus Galleries in Dundee on Sunday, September 26, when ancestral historian and highly-popular television presenter, Nick Barratt will examine how family history has been transformed by media channels such as the internet. “This will be my third visit to the Tayroots Festival and every time, I am further impressed by the enthusiasm ancestral history is greeted with and the wealth of ancestral research material available in the Angus and Dundee area,” said Nick. The Angus & Dundee Roots Festival 2010 will also be celebrating the 21st anniversary of the Angus Archives, which house hundreds of years of documents and records relating to the families, buildings and businesses of the county of Angus. Very aptly, the anniversary celebrations at the Angus Archives on Monday, September 27 will include free Deceased On Line taster sessions, a local history quiz, entry to a prize draw for a copy of ‘Angus in Old Photos’, children’s activities, tea, coffee, birthday cake – and a glass of celebratory fizz! There will also be a tour of Dundee’s Howff Graveyard, the final resting place for people from all echelons of Dundee’s society. These graves, which stretch back to medieval times, have many fascinating stories to tell – and this tour will be a chance to hear the best of these, while also learning about the mysterious symbols that are carved into the gravestones. The Local & Family History Fair in Montrose Town Hall will provide an extensive range of opportunities for family historians to undertake research or seek advice from experts, specialist organisations and groups. Other highlights of the Angus & Dundee Roots Festival 2010 include guided history walking tours; talks from experts in genealogical research; and open days at Tay Valley Family History Centre, Dundee University Archives, Dundee Family History Centre and Angus Registrars. In addition, there will be an evening of traditional stories and music by Master Storyteller Bob Pegg and harpist Heather Yule. The Angus and Dundee Roots Festival is organised by Tayroots, a joint initiative by Angus Council and Dundee City Council to promote ancestral tourism. For more information about the Angus & Dundee Roots Festival, visit www.tayroots.com. Following my last post on the new rules to save money and energy at the ScotlandsPeople Centre, I've since been informed this will apply to both the new ScotlandsPeople Centre computers found throughout most of the centre, and the older DIGROS system located in the Dundas Room. I've now been kindly supplied with a copy of the new instruction guides which will be displayed beside each computer to instruct you how to switch them on yourself when you start in the mornings. As of Monday 26th July, the new system comes into operation. It's a simple idea, but one which should save the centre a considerable amount, and which should only take a minute or two out of your routine to implement. (Thanks again to Dee Williams at the centre). Gordon Douglas, author of "We'll Send You Tae the Mars", is searching for more relatives of the 65000 boys who served on the Mars training vessel off Dundee between 1869 and 1929 for a follow up book "Sons of the Mars". For more on the story visit the All Voices coverage at www.allvoices.com/contributed-news/6363331-scottish-author-seeks-descendants-of-6500-lost-boys. The National Library of Scotland has uploaded over 2000 historic images to the Flickr website, with a further 1000 expected to be added later this year. For more, see the Scotsman's coverage at http://thescotsman.scotsman.com/news/National-Library-of-Scotland39s-historic.6430516.jp. Former Doctor Who Sylvester McCoy is to be the Chieftain at this year's Highland Gathering in Dunoon, the largest games in Scotland. McCoy was born in Dunoon, and spent the first 18 years of his life there. The event takes place in August. For more on the story visit Outpost Gallifrey at http://gallifreynewsbase.blogspot.com/2010/07/sylvester-mccoy-appointed-chieftain-at.html. The good news on the Irish Family History Foundation website's new redesign looks like it is even better than at first presented. As I mentioned in my post yesterday, I previously had two very long standing criticisms, on site functionality and cost. How the organisation has now very effectively addressed the first point has been covered in my first post - but it looks like the IFHF has also gone some way to address the second. I did two baptismal searches last night for couples in Kilkenny, using only the parents' names - no parish and no year. In each case I had 5 children returned. To view the records, in the past I would have had to pay 25 Euros, but in fact I was only charged 20 Euros in each case. This means that each record cost me 4 Euros to view, and not 5. However, I was again contacted by Bob Forrest this morning, who has also been using the site last night. In his case, a parent search returned 12 children - but he only had to pay 30 Euros. Therefore, in his case, each record was just 2.5 Euros to view. So it looks like the IFHF is offering significant discounts on the returns of records in family groups. This is yet another very welcome move. The discount is only for records in the pilot advanced search counties, but hopefully it will be rolled out as a general feature in due course. In light of this, I was amused to see the comment on the payment page suggesting that you may wish to buy eight records in advance at a cost of 40 Euros, to save you having to keep using your credit card - well God loves a trier, doesn't he (or she!)! My advice is to try the parent search first, but only if you know both names fully (i.e. mum's maiden name also). If they had eight kids, you may not actually need to spend forty Euros up front - you may get a discount. Again, credit where it is due, and thanks to the IFHF for a move on this front also. The organisation kindly informed me last night that Derry records are now online with the new advanced search capability, and that Laois and Offaly are expected to be upgraded soon. Once again, many thanks to the IFHF. Long term readers of this blog and various articles I have written over the last few years will know that I have often been critical about the online pay-per-view records website of the Irish Family History Foundation. I had two major problems with the site. The first was that each record costs 5 Euros. For the transcriptions on offer, I don't think that compares favourably with the chance to obtain actual photocopies from civil registers for 6 Euros from the GRO in Ireland. However, not all records are civil records, and so much is unique on the databases represented. The biggest problem I had, however, was much more serious - the fact that it was virtually impossible to find the correct entry prior to making a purchase, because the search fields were so restrictive. If your ancestor was John Smith, son of John Smith, you may well have paid a small fortune trying to find the right entry. In recent times, some effort was made to address this, by introducing some extra fields such as father's first name, but with my own research, I left much of it until the free censuses came online, as that was the only other way I could narrow down the likely options before parting with my hard earned cash. Even so, I have still wasted money, and like many others, have found that that has not endeared me to the site. The Irish Family History Foundation’s county genealogy centres provide Ireland’s largest genealogical research service, both online and via commissioned research services. We would like to welcome all our users, new and old, to our newly designed website. We hope that this updated site will be more user friendly and allow you to advance your family history searches. Among the new features is an improved help section, a pilot advanced search facility and a news section. We will also be highlighting new publications and events relating to genealogy, local history, tourism and culture. If you have not visited the site in a while please log in and take a look. You will find new data and a new search facility. We will be adding many new records to the site in the autumn. Please stay in touch. The Advanced Search adds a number of fields to the search criteria for Birth/Baptism and Marriage records and changes the way you pay to view the full details of these records. The new search facility is available on a pilot basis for searching the data of the following counties only: Cavan, Fermanagh, Galway West, Kildare, Kilkenny, Tipperary North, Tyrone, and Westmeath. With Baptism/Birth searches, in addition to all the search fields in the Standard Search, you can now also search by Mother's First Name and Mother's Surname, by combining this with the Father's First Name and Surname it allows you to easily find all siblings within the same family. With Marriage searches, in addition to all the search fields in the Standard search, you can now search by Spouse's First Name, Spouse's Surname, Father's First Name (please note that the names of parents may not been recorded in the original record). When using the Advanced Search option you cannot purchase individual records unless only one match is located. You will be able to purchase the entire record set located at a reduced cost. By entering as much detail into the search form as possible you can narrow your search to produce as few as matches as possible. You can then decide to purchase all these records at a reduced cost. Rome was not built in a day - and this is a pilot - but this is a VERY welcome step forward, and all credit to those responsible for responding to the long standing criticisms. I hope all the IFHF databases will be updated in due course, and make it the user friendly site that it has long needed to be, and to be frank, has long deserved to be. I fully recognise the sheer graft it has taken to create the databases, it was only the accessibility to the information online which seriously let it down. The cost is still high in my opnion, but at least if I choose to spend 5 Euros now, I'm in with a shot of being able to decide in advance whether it is worth the purchase, and that is all I ask from any site offering records for sale. One final point - the site to access for the pilot is www.rootsireland.ie - not www.irish-roots.ie. The latter has not been updated, but is still live - I hope the IFHF can now wind down this original site and concentrate on the new site, otherwise it may confuse many who have the original site bookmarked. A seriously HUGE thank you to the IFHF for doing what has long needed to be done. UPDATE 20 JUL: Advanced search for Derry is now available also. The Edinburgh based ScotlandsPeople Centre (http://www.scotlandspeoplehub.gov.uk/) is making a change that will affect all users visiting to do some research. From Monday 26th July 2010, whenever you arrive you will need to switch on the terminal that you will be working at yourself. Since the centre opened, it had been regular practice to switch every terminal on at 8.00am despite the facility not being open until an hour later, and with many customers not arriving until the middle of the morning. That's a lot of wasted energy, and in an era where Government is looking to make savings and to be more environmentally responsible, the new rule ticks all the right boxes, and in my view should be welcomed. For those who are not as computer aware as others, there will be a set of instructions posted beside each terminal which will be illustrated with screengrabs, so the process will be fairly straightforward, but even if problems do emerge, the staff are only mere feet away and can help. Visitors will not need to switch off terminals when they finish, but are asked to let a staff member know when they are about to leave, and it will be done for you. The first of the new series of Who Do You Think You Are was broadcast last night, featuring entertainer Bruce Forsyth. If you missed it, it is still accessible on the BBC iPlayer for the next seven days, and if you don't want to know the score, LOOK AWAY NOW! I'll be honest and say that I thought it was a very average programme. Yes it is an entertainment programme these days, and not so much a genealogy show any more, but even so, I found it a bit drawn out, and to be blunt, fairly unremarkable. Don't get me wrong, genealogy is not often considered to be a spectator sport - our ancestors mean something more to us in most cases than they ever will to most onlookers, and I'm sure it was no different for Bruce Forsyth. But it was all a bit 'meh' really in the portrayal. The story not only felt like it had been previously researched, we were actually told in the opening moments that it had been - Bruce had received a letter suggesting his great grandfather was a bigamist. So it felt awfully contrived to make our way towards the reunion with the Americans 40 minutes in, when I'm guessing the letter writer was probably the main research consultant! I have to add, there are only so many ways programme makers can create artificial environments just to contrive a look at a census record! People often comment that Who Do You Think You Are encourages people to get stuck in themselves into the world of genealogy. To a degree that may be true. But it also distorts the process, and makes it difficult watching at times for those who do actually research their ancestors, because at times it bears little resemblance to our own efforts. But the fundamental thing for me is the point of the programme. I am not anti-WDYTYA, but I am usually fairly anti-cult of celebrity. In this programme, though, I felt that Bruce was one hundred per cent genuine in his desire to participate, not something I would level at all those who have taken part in the past. But whilst Bruce perhaps got what he wanted from the journey, as a viewer I just felt that I didn't get out of it the hour that I invested. I want to see what impact the discoveries make - what do the revelations mean to the person involved, and how had that changed them, if indeed it has? Ian Hyslop once stood on a Hebridean island in the pouring rain and knew there and then that he could close the book on the past - he was a happy city dweller, his gene pool had moved on, and he found little in common with that aspect of his ancestry! Fair enough - I know he came away with an understanding about himself from his experience - that to me is the true point of researching your family history (to know where you are going you need to know where you have been!). If the celebrity is important to latch a programme around, no problems, but I can't help feeling many others out there had much more powerful tales of bigamy that could have been told in a television format in a much more powerful way. Not a disastrous programme by any means - just a bit long winded, and I suspect chosen to be the first in the run because Bruce is BBC royalty, rather than having the most powerful story. One of the oldest implements used by our agricultural labouring ancestors could well be on the way back - the scythe. There's an interesting report on the possibility at www.bbc.co.uk/news/10559358. Today saw the last of the 250 Australian and British soldiers to be reinterred at the new purpose built Fromelles Military Cemetery. The soldiers lost their lives 94 years ago in an action constructed as a diversionary tactic during the Battle of the Somme and were only recently discovered through an archaeological excavation of several hastily dug burial pits which contained their remains. The BBC has a report on the dedication ceremony at www.bbc.co.uk/news/uk-10679715. If you have ancestors from Shetland, life is about to get a little easier on the research front, now that the island's archive has placed its catalogue online. It has taken the Lerwick based facility five years to create an internet based catalogue, documenting some 100,000 documents, but the results can now be searched at www.calmview.eu/ShetlandArchive/CalmView/ (the main archive address is www.shetland-museum.org.uk). The archive contains council papers, court records, oral history recordings and more, including many locally based periodicals such as the New Shetlander, Shetland Life and Shetland Fishing News, all of which have been meticulously catalogued. The full story is at www.shetland-news.co.uk/2010/July/news/Archives%20catalogue%20goes%20online.htm. Orkney Archives - completely brilliant! It's official folks - Orkney Archives are completely brilliant! If you don't believe me, visit the archive's latest blog post at http://orkneyarchive.blogspot.com/2010/07/go-team-orkney.html. The BBC has a short report on a new book charting the raids by the German Luftwaffe over Scotland in WW2. To view the report visit www.bbc.co.uk/news/uk-scotland-10671907 - and apologies for the horrendous new look of the BBC news website (outwith my control!). There are a few more, you'll find them all at YouTube (www.youtube.com) - type in "FindmyPast" and you'll soon see them! Pharos Teaching and Tutoring Ltd runs a series of popular and inexpensive courses on various aspects of genealogical research across the British Isles. Yours truly teaches two of these courses - Scottish Research Online and Scotland 1750-1850: Beyond the OPRs. Both last for five weeks and cost just £43.99. The courses were initially established by Canadian genealogist Sherry Irvine, and are now regularly updated by myself to take into account continuing developments in the Scottish genealogical world. I'm currently teaching the second of these right now, 1750-1850, and the next time the online resources course will be taught is October 18th. The courses are concise, designed to help with research strategy as much as the availability of resources - and they just happen to be fun also! On each course there is a dedicated forum for the class and myself to discuss issues arising from each lesson, and once a week we have an online live chat. The last two courses have proved so well subscribed to that I have actually run two chats a week to cater for the demand, so there are never so many participants that you can't be heard. It is advised that you do the online course first prior to the second, as much of the resources referred to in the second touch on previously discussed topics in the first. For full descriptions of the course content, visit the links above. I am also planning to develop a new course on Scottish occupational research for 2011 - more on that once I've written it! The hope is that it can be up and running by the middle of next year. 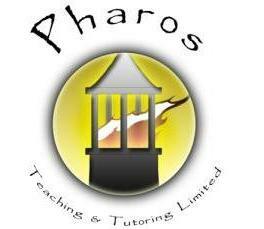 Don't forget to check out the other courses offered by Pharos, there is something there for everyone. If you have English ancestry, there is also a newly launched longer certificate programme well worth exploring, taking in several short courses. For those of you with more blessed blood (all praise to St Andrew! ), don't forget, Scottish Research Online, five weeks from October 18th 2011 - well worth signing up to. Hopefully see you there! As many readers know, I work as a full time genealogist as well as a full time newshound and writer! Traditionally I charge by an hourly rate for the work I do, normally at the ScotlandsPeople Centre in Edinburgh, and for any additional costs, usually travel (set rate of £20, though usually costs me a bit more!) and the cost of access to the building (£10). Details available at my Scotland's Greatest Story research website here. However, for some time I’ve been considering a different approach for helping those starting off in Scottish genealogy, for several reasons. First, the civil records are very well digitised at the centre, and it seems ludicrous to be charging a high professional rate for what is essentially a straightforward search backwards in most cases, certainly for the statutory period post 1855. Don’t get me wrong, a bit of problem solving has to occasionally be applied, but before 1855 things tend to get a bit more tricky, and it is then that I think such a rate can be more easily justified, when different skills tend to kick in. I also believe that in the spirit of today’s day and age in the genealogical world, price should not be a barrier to the access of heritage. A full day’s search at the centre, plus travel, normally costs in the region of £165 through my service (worked out at 7.5 hours at £18, plus £10 access fee, and £20 set rate travel fee). Although the professional rate is usually £20/hour, even at £18/hour it’s a lot to pay if you are initially just wanting to dip your toe into the water. b) It’s an ancestral search, looking at all Scottish lines going back (though any emergent English, Welsh or Irish lines will be investigated as far as possible at the centre). For any descendancy work, I’m happy to still help, just do bear in mind that with common names it takes more time to look forward in the earlier periods (i.e. with a name like Smith or MacDonald). Sources used will be civil BMD records from 1855 to the present day, OPR vital records, censuses, monumental inscriptions, and all resources available and required at the centre (and if necessary at the National Archives of Scotland next door). c) Normally I charge first hour, travel and SP access fee as a deposit. For this offer, I will simplify things – a £50 deposit to be paid in advance, and the balance upon completion. (NB: If paying by PayPal, an additional charge of £4 will be added to cover service costs). d) The results will be e-mailed only, but you will still get all the relevant charts, reports and research notes - but you will need to print off the research yourself. e) If you want actual copies of records they will be charged extra on top of the £100 fee, but at the centre’s set rates. Records will otherwise be supplied as transcriptions. f) It’s rare that all research brick walls are hit in one day’s research – so if you require the work to be continued after a day, it will then be charged at the standard rate at £18 per hour on future visits, plus expenses. In a single day I am usually able to get back several generations to the parish records period (pre-1855), but it will depend on the size of families, and the amount of detail you wish to go for (full tree development with all siblings worked out, or purely ancestors, etc). But if you are thinking about looking into your research, or wish for example to get 20th Century records examined which are not yet online and will cost considerbaly more to order as official extracts, hopefully this new basic Foundation Research package will be a useful way to get you going! To make use of the offer, contact me at enquiry@scotlandsgreateststory.co.uk - the offer ends Wednesday 18th August 2010. We're confident that these records will vastly improve your experience of researching your family history. Viewing each result will cost five credits. You can still browse the originals and check the transcriptions against the improved greyscale images. To view each result will cost one credit. Fully indexing the birth records involved rescanning 170 years of records and transcribing the quarter of a billion names within them. Over 1,000 people have worked on this exciting two-year project. What makes the fully indexed birth records so useful? If you haven't had success finding an ancestor's birth record previously, it's definitely worth trying again using the fully indexed birth records. We're in the process of fully indexing our marriage and death records too, and expect to complete this project by the end of the year. We'll keep you posted. The Kirk has backed a potential plan by the Scottish Government to allow old graves to be deepened after a period of 75 years to allow new burials to take place. The original inhabitant or inhabitants of the grave would be temporarily removed to allow the plot to be deepened, reinterred, and then new burials would follow suit above. The Kirk sees it as a 'reasonable and respectful' suggestion. The Free Church, Roman Catholic Church and Jewish bodies disagree, whilst the Muslim Council of Scotland believe it should happen as a last resort, and only to relatives. The full story is in the Scotsman at http://news.scotsman.com/news/RIP-for-75-years-40then.6420660.jp. I've no idea who gets priority when it comes to the headstones! The Addressing History project, which will link data from several Edinburgh based street directories to contemporary maps, has posted an update on the work on their blog. It is a tad technical, but you'll get the point of how useful it will be, with exampes of how all the bakers in the city can be researched with a search, or all those sharing a similar surname. The post is at http://addressinghistory.blogs.edina.ac.uk/2010/07/14/software-developments/ - looks like it is shaping up to be a great project. What are the best Scottish genealogy books? By far and away, the best is Rosemary Bigwood's book The Scottish Family Tree Detective: Tracing Your Ancestors in Scotland (Manchester University Press, 2006). What makes it work is the combination of top insight into the world of Scottish genealogical records and a superb writing style - it's an academic book in some regards, but not written in an academic manner, and half the battle is making something readable in the first place! Very punchy, and directly to the point. Another key resource I have is a golden oldie really - National Index of Parish Registers Vol XII: Sources for Scottish Genealogy and Family History, by D. J. Steel (Society of Genealogists, 1970). A real highlight are the sections on marriage and on the history of the different churches in Scotland, yet to be bettered in a genealogical guide - and immense kudos for identifying family history and genealogy as separate disciplines in the title! On the downside, it is a bit out of date in terms of describing the locations of records, but you will be under no doubt as to which records you need to pursue. A faithful friend not usually far from me on the desk is Andrew Dewar Gibb's Student's Glossary of Scottish Legal Terms (W. Green & Son Ltd, Edinburgh, 1946). I stumbled on this on eBay, but it is packed with useful old legal definitions constantly referred to in records. Diane Baptie has a series of guides published by SAFHS which can also be of use. Parish Registers in the Kirk Session Records of the Church of Scotland, The Parishes, Registers & Registrars of Scotland, and most usefully, Registers of the Secession Churches of Scotland. The information is actually online, but it makes one heck of a difference to be able to pick up a guide and instantly find what you are looking for! Inexpensive, and essential for your collection really. Bruce Durie's Scottish Genealogy (2009, History Press) is also handy for land records research, and has a useful legal glossary at the back. Other handy ready reckoners include A Scottish Historian's Glossary by Lawrence R. Burness (SAFHS, 1997) and An Introduction to ... Occupations: A Preliminary List, 2nd ed by Joyce Culling (2003, FFHS), not mention the various Gibson Guides available from Family History Partnership (www.familyhistorypartnership.com). I have dozens of books on Scottish research, and on other topics such as heraldry, handwriting and more, but these are some of the more useful for practical day to day research, and for researching what Billy Connolly calls us "ordinary people"...! I hope the list might help! Ancestry.au has now posted a blog post explaining more about the new Australian BMD index collections released on the Ancestry website. 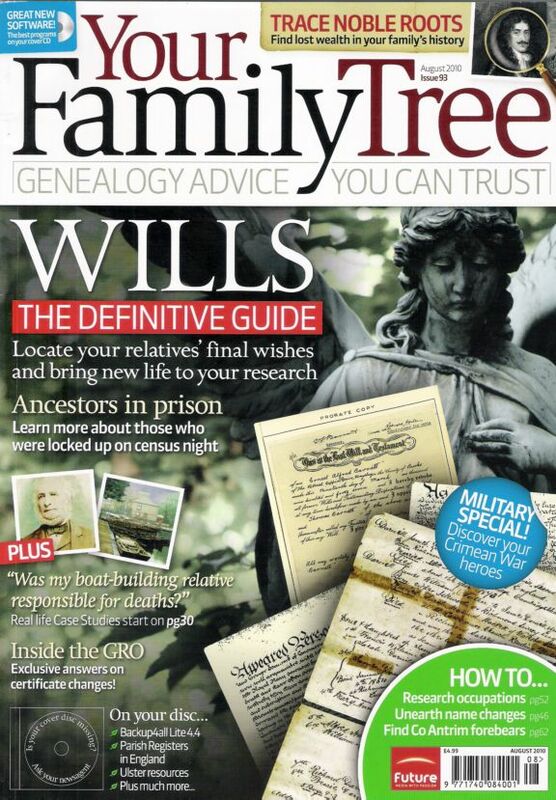 If you haven't got the foggiest clue about wills and testaments, where you might find them and how they might help you in your research, this month's eight page long cover feature in Your Family Tree (issue 93) has the definitive guide to sort you out! Written by yours truly, the article covers all you need to know about the confirmation and probate processes across the British Isles, and I have to say, is absolutely beautifully laid out by the designer with some brilliant illustrations. Also this month, Adam Rees visits the English GRO, Doreen Hopwood looks for criminal ancestors in prison, Paul Blake investigates name changes, and wait a minute, he's back again, Adam Rees looks at Chaos on the Crimea! There's also a look at occupational resources, parish registers, tracing nobility (Ní uasal aon uasal ach sinne bheith íseal. Éirímis! chortle...), and for all my chums back home, like a bad penny I'm back with a guide to online records for County Antrim, which includes two very nice photographs of God's home town of Carrickfergus! (Sorry, you can take the boy out of Carrick, but you'll never take Carrick out of the boy!). There's a cover disc also including data for Antrim, Belfast and Monaghan in 1846, and the history of English parish registers. At a stonkingly outrageous price of £4.99, do you need another reason to buy? 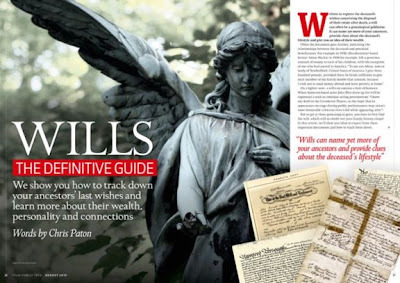 OK, here's the first page of the wills article...! The Sons of the Mars website at www.sonsofthemars.com now has a new Facebook page also at www.facebook.com/pages/Mars-Training-Ship/129163387124744?v=info. If you had ancestors who once trained on board the ship in Dundee, why not pay a visit?! Visit each of the search pages for detailed information on the commencement of civil registration in each state. Note that these are indexes and not digitised certificates, though the information supplied can help you to source the records from the appropriate registrars down under. Alexander Armstrong on WDYTYA - extended! I posted a comedy clip on YouTube featuring comedian Alexander Armstrong a couple of days ago, parodying Who Do You Think You Are?, a series which he is ironically about to appear on for real. It turns out, however, that that was an edited clip! Americans wanted on Isle of Skye! Alexander Armstrong - Who Do You Think You Are?! Public access to English and Welsh BMD registers? Scotland - land of many tongues! Did you meet in the war?